We have been having a tough time getting the school lunch balance right. Somehow we have to create a lunch that is (1) exciting enough for my daughter to eat without encouragement, (2) filling enough to get her through the afternoon, (3) an optimal balance of carbohydrates (for energy), protein, and fat (to keep her feeling full), (4) capable of being eaten fairly fast (i.e. no bags of popcorn), (5) nutrient dense, and (6) not too high in sugar. It is not an easy task, and one that we repeatedly fail at. 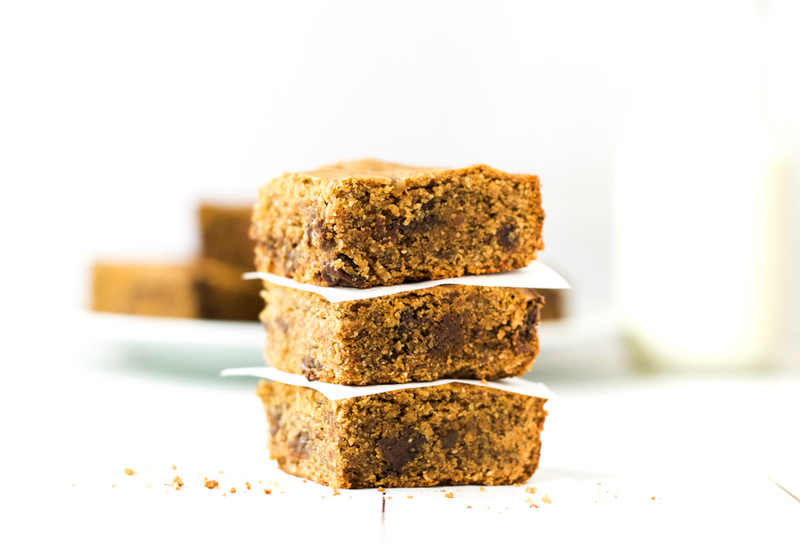 It was this school lunch issue that led me to create these delicious gluten free peanut butter chocolate chip bars. 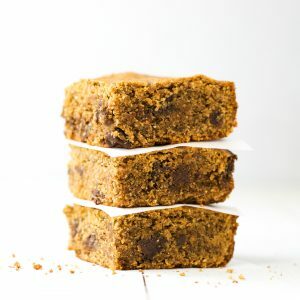 These amazingly filling and tasty little morsels contain plenty of protein from the peanut butter, egg, and oats, a burst of omega-3 fatty acids from the flax seed, and no added sugar (save for a few chocolate chips, which are there as an incentive to eat when there is no parent providing encouragement). The sweetness comes primarily from the dates, which contain potassium and plenty of fiber along with the natural sugar they contain. 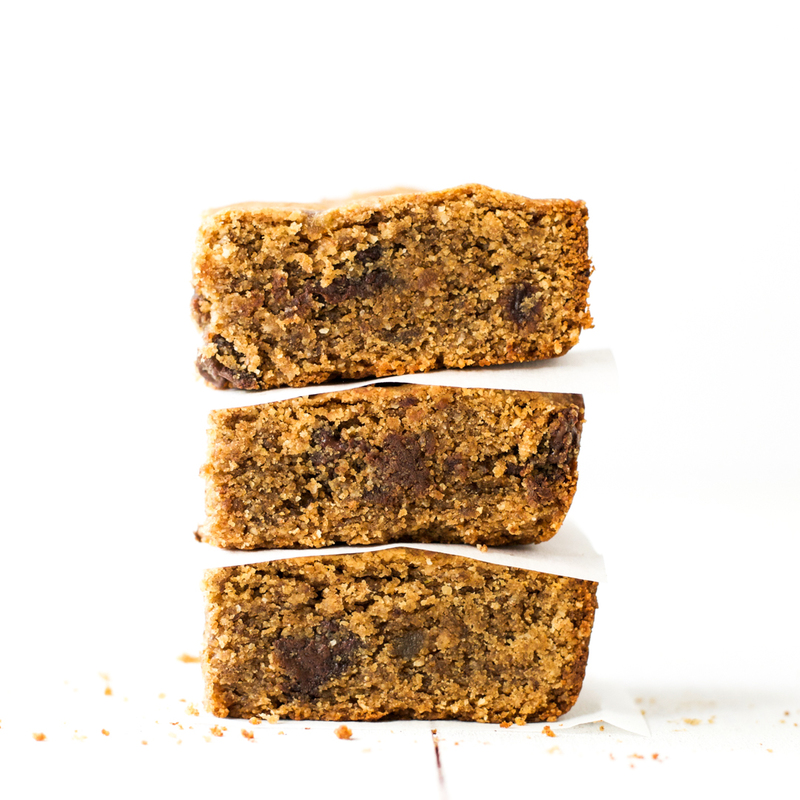 And as long as you buy gluten-free oats, these peanut butter chocolate chip bars are also gluten free. Line 8×8 baking tin with parchment paper, or lightly coat with cooking spray or butter. Blend the oats until fine. Add the baking soda, flax seed, and salt to the oats and mix. In a separate bowl, pour ¼ cup hot water over ½ cup dates, let sit for a few minutes, then blend to a thick paste. Whisk the egg in a large bowl. Add the date puree, peanut butter, vanilla extract, and dry ingredients, and stir until well combined. Pour mixture into the prepared baking tin and press down firmly all over (I found it easiest to do this with my hands). Remove from oven and leave to cool in the baking tin. Once cool, remove from the tin, cut into squares, and enjoy. I hope you like them. And you can always put in fewer chocolate chips if you want to cut the sugar even more. I bet they would still be good with 1/2 cup instead of 2/3. You’re welcome. I like to include oats in my recipes too. A nice way to boost energy and fiber intake. Would this recipe work if i used flour instead of oats? I haven’t tried it, but yes I think it would. 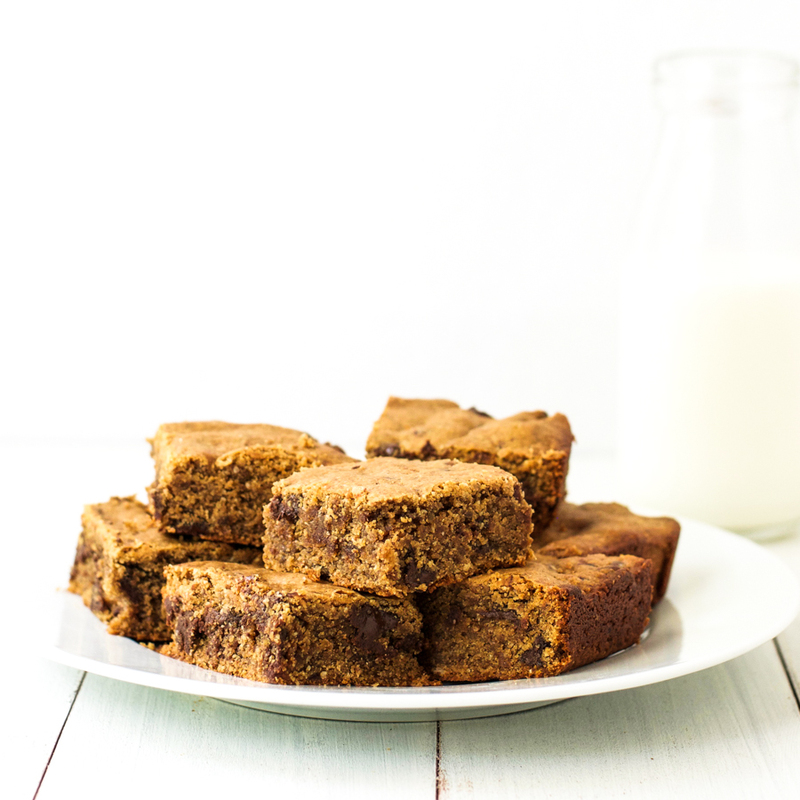 Being a Celiac, I am always baking snacks and looking for new recipes that avoid gluten. I realize that everyone’s tastebuds differ, but . . . prepared according to directions, and they were (as my husband stated): “Absolutely tasteless.” I could not agree more. Far too dry; needs something to moisten the mix. One of life’s little experiments thrown into the trash.